With the animal transport from farms to slaughter houses comes suffering and brutality. Even though country laws determine the transport conditions, the actual transport includes more than just travel to the slaughterhouse. It is common today to raise animals that are miles away from the slaughterhouses and the transport by trucks, ships, and planes from country to country includes hunger, thirst, and various weather conditions and lack of space. Animals often spend 48 to 72 hours in trucks withouth being let outside and they are forced to pass waste from their bodies inside trucks. 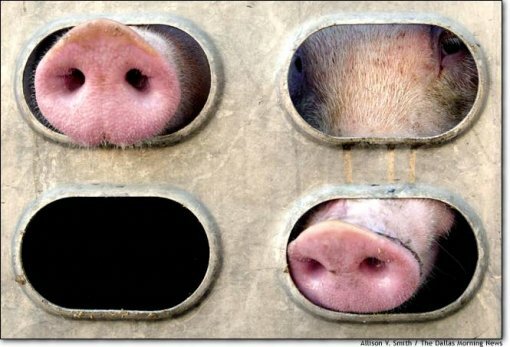 Animals that are loaded in trucks for the first time in their lives are frightened and the people who load them are often cruel and careless. After a day or two spent in trucks the animals become extremely hungry and thirsty. During winter transport cold winds can cause serious colds and in summer transport heat contributes to severe dehidraton. It is difficult to imagine the suffering and stress that manifests in animals through fear, motion sickness, hunger, thirst, exhaustion, and colds. Two main reactions that animals have during transport are "collecting" and "travel fever". All animals loose weight during transport. Dehidration as well as waste passing contribute to most of weight loss. However, weight loss can often be long term. It is not unusual that during transport a 360 kg bull looses 31 kg or 9% of his own weight and it could take more than three weeks for the animal to regain that loss. That "collecting" is caused by stress the animal is put through. "Travel fever" is a type of pneumonia that animals get after the transport and it is associated with the virus that healthy animals can easily fight, serious stress. However, their immune system weakens significantly. Animals that experience "collecting" and "travel fever" go through extreme stress but they are the ones who manage to survive the transport. Others die before they reach their final destination or they arrive with broken limbs and other wounds. In winter time they die from hypothermia and in summer from thirst and dehidration. They die lying down from wounds they got falling down the loading ramps withouth any supervision. They also die suffocating when other animals climb on them in crowded and carelessly overloaded trucks. They die from thirst and hunger and from people's neglect or from stress caused by horrible transport experience. Animal deaths that people consume on daily basis are always a part of the whole process that preceeded slaughtering.